VH1's Martha & Snoop’s Potluck Party Challenge, a series of special editions of Martha & Snoop’s Potluck Dinner Party, premieres on April 3, per a press release. 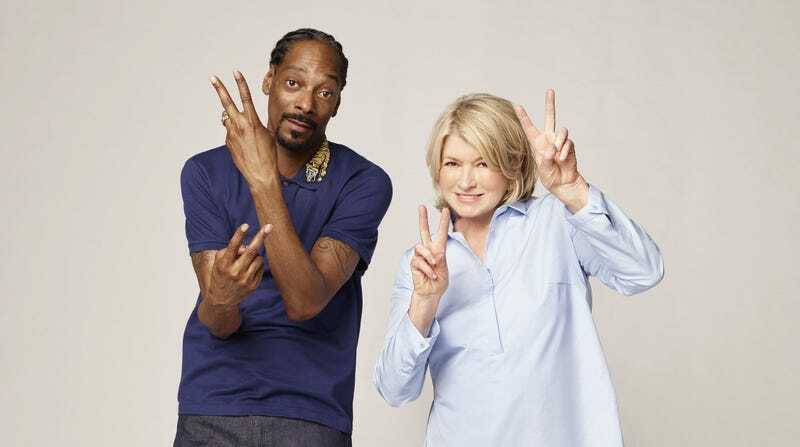 In the series, Martha and Snoop will face off against each other in “friendly culinary challenges” with the help of a cast of famous “teammates.” A celebrity judge will then choose a winner, who gets the “Potluck Party Platter” prize, which I imagine to be a lot like the Great British Baking Show cake stand, but probably with a marijuana-leaf-design motif of some kind. I love a dumb reality competition, and this one appeals all by itself—but when you get to the roster of famous people swinging by, it gets significantly more ridiculous. That’s a good thing. An example: That first episode, which airs at 10 p.m. Eastern on April 3, will see Matthew McConaughey and Method Man join the teams, and the guest judge is Isla Fisher. Future guests include Tiffany Haddish, Octavia Spencer, all three Jonas brothers, Regina Hall, Rev Run, Michael Strahan, Yvonne Orji, Jimmy Kimmel (with Guillermo, naturally), Eve, Paris Hilton, Tamar Braxton, William Shatner, and Trey Songz, to name a few. Like I said, ridiculous. Most of the specials seem to be tied to holidays (this one’s “4/20,” because of course it is) so expect future editions to pop up on VH1 right when you’d expect.